The natural backdrop and lush open spaces of our community make for the perfect event venue. Held inside the community at the Fulbrook gazebo, this free event seeks to bring the community together to enjoy the small-town charm of Fulshear, Texas. Performances begin at 7 p.m. and rock until 9 p.m. Blankets, coolers and lawn chairs are encouraged. 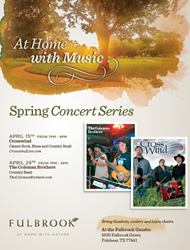 The first concert will kick off on Friday, April 15 and will feature the classic rock and blues band known as Crosswind — a solid group of long-time veteran singer/songwriters of Texas/Americana music. On Friday, April 29, The Coleman Brothers will perform their hit new single “Getting Over You” along with other new country favorites. As seen in Nashville, Tennessee, The Coleman Brothers have opened for bands such as Willie Nelson and Dierks Bentley. To learn more about Fulbrook and the spring concert series, visit fulbrookhomes.com.